I think every sewist out there, no matter how much equipment you have, has a "wishlist" of all kinds of stuff that would make your life easier, your products look better, your sales go up, or maybe just make you and your family and friends (whoever you sew for) happy. I definitely do. 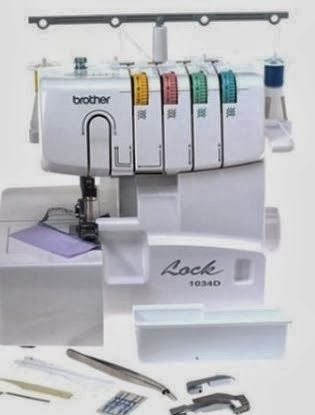 And at the top of my list, currently - a serger! For me, a serger would let me expand my capabilities in ways a regular sewing machine can't. Those nice trimmed evenly finished seams? Done. Faster production? Done. I do have an overlock stitch on my machine right now, which does almost the same thing - but those fraying edges on woven cottons will just never look as nice as they could. **I'm blogging about the giveaway in order to receive extra entries into the giveaway. This option is open to all participants with a blog, but there are five additional ways to enter as well - now go check it out! Putting an end to "selfishness"